On the evening of November 11th 2018, the Sunday when Britain traditionally remembers its war dead, Alexandra Palace in North London was giving thanks for life. 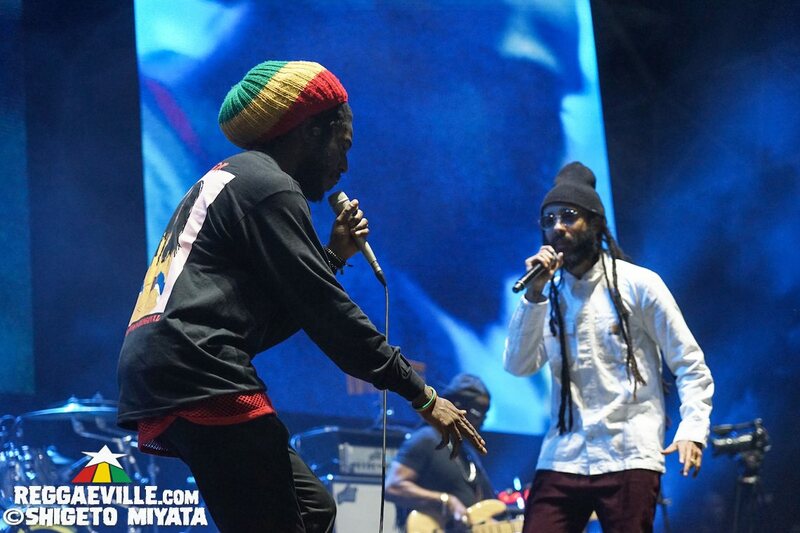 10,000 reggae fans climbed the hill to glass “People’s Palace” to watch Chronixx and his friend Protoje perform a sold-out show featuring a procession of special guests. 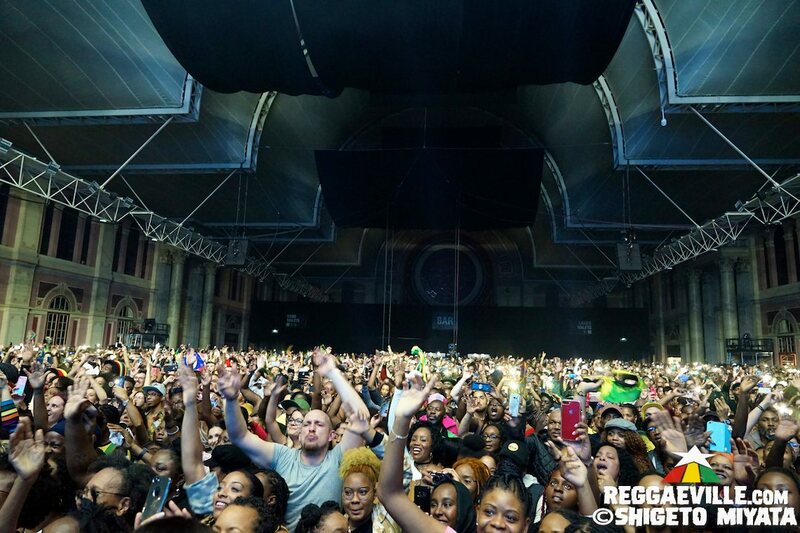 The Ally Pally gig was the centrepiece of a weeklong Chronixx London takeover. On Saturday 10th a Chronixx Popup Shop opened in Brixton Market [check the photo report here! ], with a BBC concert at Tobacco Dock in the evening. A third concert was scheduled for Monday 12th at Bush Hall in Shepherds Bush. 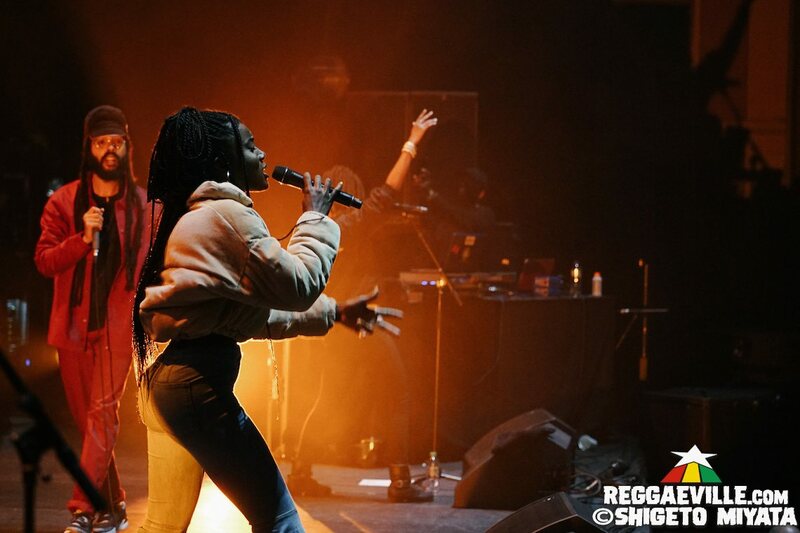 It was the culmination of multiple visits by these two figureheads of the 21st century Jamaican Rasta reggae resurgence, growing their fanbases into an undeniably popular movement in the notoriously hard-to-please London scene. On the way to the venue it was clear this was no ordinary reggae show. Touts stood at the train station asking if anyone was selling tickets. A Chronixx red bus shuttled people up the hill to the Palace. A vast perfect crescent moon hung in the sky. From the hilltop the lights of the city shone below like the view from Kingston Dub Club. By 6pm an extraordinarily long line of ticket holders snaked along entire length of building – those at the front had been there since half past four. Inside, under a massive red gold and green banner above the stage, selector Allan Brando warmed the gathering crowd with a selection of Bob, Dennis, Barrington and a get-well spin of Heaven In Her Eyes for Gappy Ranks, recovering from a stroke. Meanwhile Protoje’s Indiggnation band had quietly plugged in their instruments, before striking up their signature opening theme from the Godfather Part II. Protoje, who has cultivated his London following like a green fingered gardener, bounded on dressed in red. To the rock meets dub sounds of his usual opener I and I, each syllable of his rapid, rap-diction wordplay rang out across the huge hall. He demanded everyone put their hands up, casting a giant silhouette of himself onto the wall at the side of the stage. Chronixx collab Flames from latest album A Matter Of Time featured the recorded voice of Chronixx rather than the real thing – surely soon to come. Then Protoje got political. “There’s a war going on in the world and nobody is safe. I’m on the side of love. Are you on side of love?” This was his intro to Criminal, from previous project Ancient Future. He stopped short of naming the culprits saying “You and I know who the criminals are”. The politician-spurning Sudden Flight brought on the first guest, Proto’s own label signing Sevana. She strode on in bell bottoms to huge cheers for her chorus, her bell voice pristine. “All Jamaicans put your hands up” he asked for another attack on Jamaican political corruption, Blood Money. “I have a new album” said Protoje “If you don’t know it don’t feel bad. I’ll teach you” leading the crowd in an acapella of recently Radio 1 playlisted single Like This. It got a massive forward, suggesting many knew it already. Then he invited out more surprise guests, UK rap collective WSTRN who performed their track Ben Ova. A Selassie portrait appeared on the screens as the band commenced Hail Rastafari. Immediately, the glass palace became a green house, a fragrant fug displacing the excessive dry ice. “I’ve done 15 shows in 17 days” challenged Protoje “You show me you have energy” engaging in a dance off with keyboardist Paris to a thumping Indiggnation Dubwise that morphed into Black Uhuru’s I Love King Selassie. It was a typically assured looking performance from Protoje but on the big screen you could see the sweat on his face. Half an hour later Chronixx took the mic to what can only be described as a roaring sea of humanity. “Rastafari” he said in his soft high voice, standing rake thin under his wide tam, as the Zincfence Redemption band recreated the vintage rhythm to Alpha and Omega. Where Protoje had bounced around the stage Chronixx stayed stock still, holding the attention of ten thousand people with his enigmatic smile. Everyone in the place sang along to Ain’t No Giving In. They demanded a wheel up of They Don’t Know yet Chronixx pressed on, perhaps conscious of the 11pm curfew. “Respect to all queens, all mothers, all sisters” he said by way of introduction to Queen Majesty on the Studio 1 rhythm to Otis Gayle’s I’ll Be Around. Where the Indiggnation were crunchy and rocky Zincefence were tight, jazzy and breezy, peppered with liberal sprinklings of Hector Lewis’ percussion. The place erupted into mellow introspection for Skanking Sweet. It was remarkable how such a delicate voice can command ten thousand as he led them singing the chorus in pared down ballad style. The next segment departed from one drop reggae for the more diverse beats of the second half of 2017 album Chronology. A huge forward with whistles greeted Black Is Beautiful. The line “this is not a racist song” created a palpable ripple of emotion. After the sweet seriousness of Smile Jamaica it was Chronixx’ turn to address politics – but this time he named names. “Big respect to all Jamaicans. The only thing stop Jamaica is the two parties. They use the colonial Westminster system. Colonial loyalists don’t want to defend youths” This perfectly set up the starkly inarguable rebuke of historic exploitation Capture Land. As it had at the Somerset House show back in 2015, the “Thiefing Queen from England” line felt visceral, a flung stone at the glass ceiling of the stately Victorian building. Then it was sound system time, as Spanish Town Rocking became a freestyle chat that begat Tracy Chapman’s Baby Can I Hold You and its original piece, Barrington Levy’s Prison Oval Rock. After News Carrying Dread/Tenement Yard (the only tune to get a wheel) he introduced his two guests, both from Spanish Town, 18 year old rising sensation Koffee and his father Chronicle. Koffee’s extraordinary flow was hampered slightly by mic volume and monitor issues but she still got a big response to her singles Raggamuffin and Burning. Chronicle embraced his vocal similarities to Barrington Levy covering Teach the Youth. Here Comes Trouble with its line about Selassie’s Army, seemed vaguely fitting for Remembrance Sunday. The sweating heaving Palace exploded for dancehall hit Likes before being brought gently back down to earth for the final tune: hymn to ordinariness, anonymity and connectedness Legend. In the song Chronixx hopes that one person will remember him for trying to make a change. Following his rocking of the ten thousand, every person there will surely remember him for life. Leaving the venue en masse and seeing the Dub Club London lights below, it felt like things would never be the same. VIEW THE PHOTO REPORT BY SHIGETO MIYATA HERE!